The last time I drank a soda was at a casual business lunch on Wednesday, May 21st. My coworkers each ordered a sandwich and a soda to go with it, so I did too. I was trying to cut soda out of my diet and had not had one for over a week, but the diet coke was right there, tempting me. It was easy to pick up, it would taste good, and it would give me a boost that would carry me through the afternoon. As bad habits go, soda isn’t such a big deal. It won’t kill me slowly like cigarettes will, and it’s not something nasty like chewing on my cuticles. Sure, it’s linked to obesity, but I am reasonably trim. And while I’m sure there are studies that link it to longer term health effects, these are weak correlation studies without a causal mechanism – similar ones exist for just about everything, including coffee, drinking red wine, not drinking red wine, using cell phones, and so forth. The main reason I want to get rid of soda is that it’s bad for my teeth. I have terrible teeth, with a lot of fillings, and I recently had a second crown put in. I’ve also had an implant, although the experts agree that wasn’t from drinking soda or poor care of my teeth. My dentist has assured me that one soda a day shouldn’t be a problem, but he also agrees that tartar builds up incredibly fast on my teeth. When I brush them at night after having drunk soda earlier in the day, I can feel the buildup. While I have tried to moderate soda drinking in the past, I’ve been on a major soda kick over the last year. Every afternoon I would need a boost, and I would turn to soda. I had switched from regular to diet, but from your teeth’s perspective, sugar and artificial sweetener have the same effect. The new crown was a wakeup call. I was already flossing, but I felt that I really needed to be find ways to take better care of my teeth. I knew the crown wasn’t directly caused by soda, but soda was the big thing I could eliminate that would really benefit the health of my teeth. I tried cutting out soda and was successful for a week, but then we took a trip to Europe and I found myself jet lagged and needed a recharge. I drank soda every day on that trip. When I got back, I was able to go another week without soda and then broke it again at that business lunch on May 21st. I needed more incentive to succeed. Then I remembered a Friends episode called “The One With the Ball”. In this episode, a couple of the characters get caught up in the old childhood game of seeing how long they can throw a ball back and forth without dropping it. Once you get a streak going, you really want to see how long you can extend it. It occurred to me that someone must have written an app to facilitate applying gamification to breaking a bad habit, and sure enough there was one: Streaks. You pick an activity and then check off each day you are successful in doing it (or not doing it, as the case may be). It keeps track of how long your streak has gone and compares it with your previous “high score”. On May 22nd, I didn’t drink a soda. I downloaded Streaks and checked off the first day of going soda free. Then I did it again the next day, and the day after that. Soon I had beaten my previous run of one week and started to extend it. I set some ground rules for myself… soda was out, so I mostly replaced it with flavored (unsweetened) seltzer or iced coffee, depending on how much lift I needed. I don’t worry about drinks in the gray area, as long as I don’t drink them too often. Sparkling juices like Izzy I’ve decided are okay because… well just because. Again, only as long as they aren’t regular. I allow myself to check off the box at 6pm each day, because I would never drink soda at night. It would keep me awake past midnight. Checking off the box each evening is a nice little reward for the day. I’ve managed to keep my no-soda streak alive for more than 45 days and I’m still going. 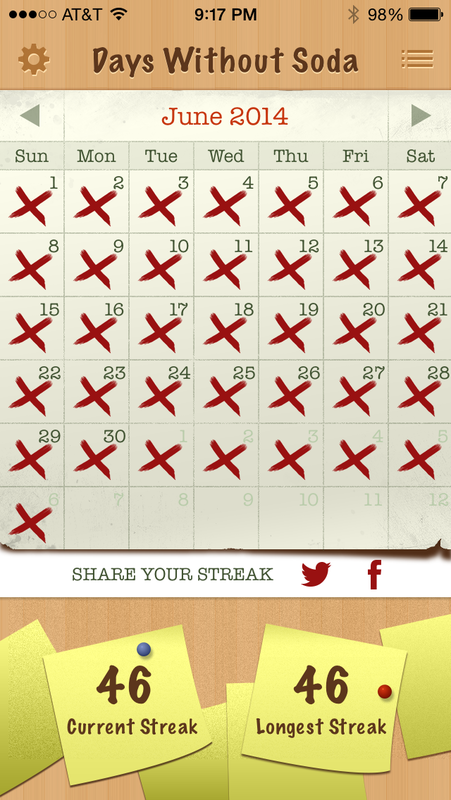 Thus far, I have kept the streak going for more than 45 days. I don’t think I have ever cut out soda for such a long period. At this number, it has become a very powerful incentive to keep going even when I am sorely tempted to drink a soda. “Sure, I could drink the soda, but I don’t want to break the streak now! I’ll go get an iced coffee instead.” For example, today we drove through grueling July 4th weekend holiday traffic. Normally, I would have gotten a soda to keep myself going in the last few hours, but I wasn’t going to break my 45 day streak just for that. The Streaks app itself has some interesting configurable features. You can set it for activities that don’t happen every day but rather every X days. For example, if you set it for every 3 days, it’s okay to skip occasional days as long as the gap is not more than 3 days. It still considers them the same streak. You can also set it so that some days don’t count, like weekends. My soda calendar doesn’t use these features, though – every day counts, no skips allowed. The best thing for me is that I can really feel the difference. Tartar builds up very quickly in my mouth, and it’s amazing to me how clean my teeth still feel since my last visit with the dental hygienist. So far, so good. On to kicking the next bad habit. This entry was posted in Uncategorized and tagged fitness, health, home technology, iOS, iPhone, methodology, shortcuts. Bookmark the permalink.